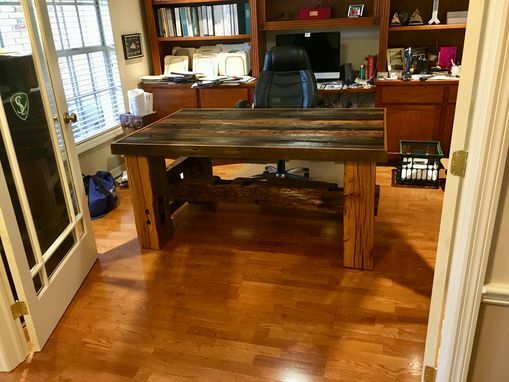 A customer requested a rustic barn beam Desk & matching Printer Stand from 100+ year old barn beams & barn siding from the family farm. Although the customer wanted to retain as much of the original surfaces of the beams & siding as possible, it was decided to cut off 2 adjoining surfaces to expose the actual wood underneath to show its beauty. Thus it was possible to display both the original rough wood surfaces as well as the beautiful wood underneath. A final request with this intriguing project was that the craftsman was to leave all original mortises, tenons, & other notches; original hardware was also to be left, as long as it did not interfere with the use of the desk or cause any injury. 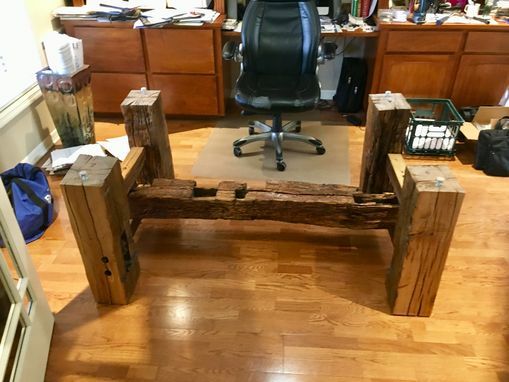 The four legs of the desk were cut from 1 long barn beam, while the supporting pieces between the legs were hand-cut from an additional but smaller barn beam. The large barn beam securing the two leg assemblies was the remainder of the barn beam from cutting the legs. It was necessary to design the Desk so it could be assembled on site after delivery. 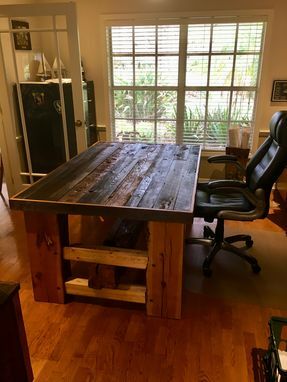 The Desk top was constructed of a sheet of 3/4" thick plywood with 3/4" thick pieces of barn wood siding glued on top. It was banded around the edges with 3/4" thick x 2-1/2" wide barn wood siding. The top was leveled by using a unique system of levelers on the top of each leg; leg bottoms were covered with a thick piece of felt to keep from scratching wood floors. Finally, the customer will install a thick piece of glass on the Desk top. 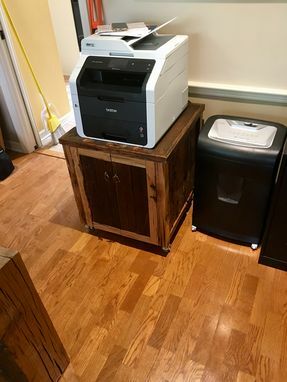 Additionally, a matching Printer Stand was made from remaining barn wood beams & siding. All hardware was either made from original hardware found on the wood or new hardware made to appear old & rusted. Lockable rubber casters completed the Printer Stand. Both the Desk & Printer Stand received several coats of a satin polyurethane finish & allowed to dry completely before delivery & assembly. Due to the uniqueness & complexity of the design & construction of the Desk & Printer Stand, it required more than 12 weeks to construct & deliver. 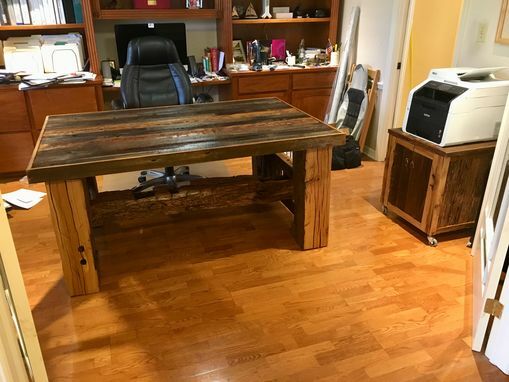 Contact the craftsman through Custommade.com for additional information regarding similar or like designs & estimated construction time/delivery.